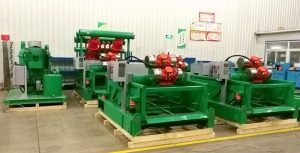 Recently GN solids control shipped 8 sets of shale shaker without vibration motor shipped to our clients, the client will install the vibration motors by themselves who had installation capability. 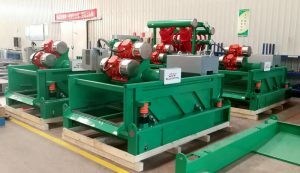 This is not the first order from this client, they repeat orders because they are satisfied with the working performance of GN shale shakers which they ordered before. Shaker deck is the most esscential components for a shale shaker, the bottom material treatment before painting, we owns our ball blasting machine, the ball blasting degree is 2.5 with working life 10 years more, we can control the bottom treatment quality better, unlike other solids control manufacturer in China, they use sand blasting which is provided by third party supplier. 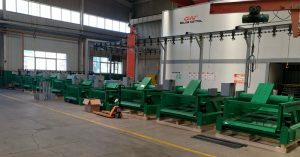 3 layers painting and coating by choosing Japan Kansai or US ppg brand painting, to promise the shaker deck not to get rusty and abrasion during the operation. 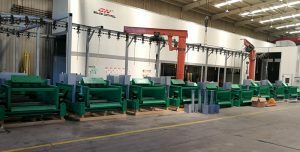 In some tenders, it required the complete the shaker deck( all the vibration and non vibration components) are made of stainless steel material, it will increase the shaker production cost a lot and the the client has to pay more money. 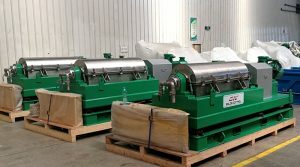 The deck bottom of GN shaker is made of stainless steel material, and the unique rubber sealing technology to ensure the reliable performance of the rubber sealings, we also use GN own made composite material shaker screens, the working life is 2 times compared with the traditional steel frame shaker screens.